[Update, 26 June, 6.00pm] oBike has gone into liquidation. He said the decision to withdraw from Singapore was “a company decision and from the board of directors”. Since Monday, CASE has received 259 complaints against oBike. The organisation says it will follow up on the matter. 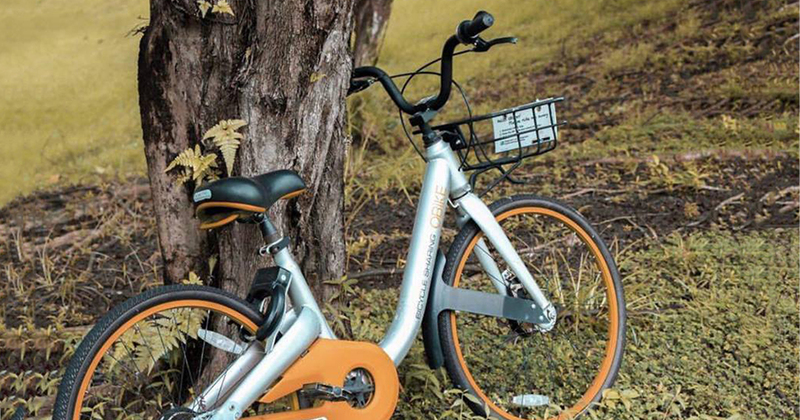 After an immediate termination of its services in Singapore yesterday, oBike has left users puzzled and angry for disappearing without a satisfactory explanation. Citing difficulties in meeting the Land Transport Authority’s (LTA) updated regulations, oBike released a ‘special announcement’ on its Facebook page saying they “regret that the new regulation measures do not favour [their beliefs]”, and falsely informing users that their services will still be available on GrabCycle. In the Facebook post, the bike-sharing company has neither apologised nor addressed how they will deal with users’ deposits and the remaining oBike bicycles still on the road. The post has received over 2,400 angry comments, mostly simply saying “#refundmyoBikedeposit”. 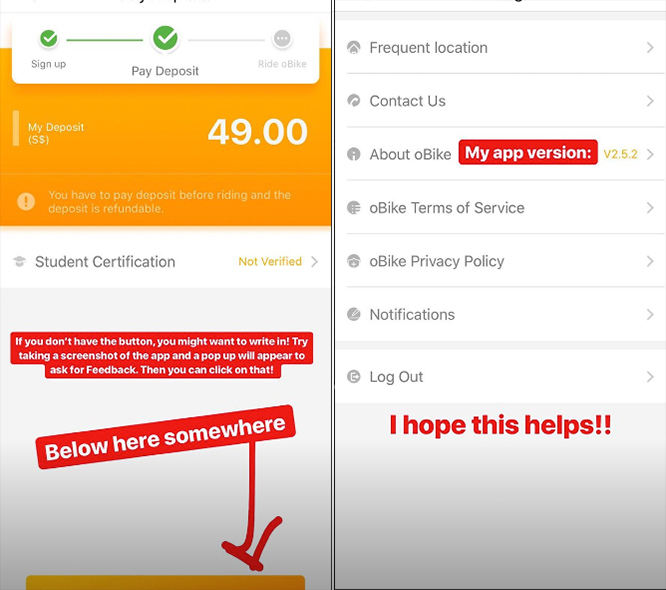 According to TODAY, oBike users have tried unsuccessfully to seek refunds on their mandatory $49 deposits (or $19 for students) by using the in-app wallet or contacting the firm via phone and email. To make matters worse, oBike’s office in Singapore has apparently already been vacated. Users have taken to Twitter to express their outrage, saying that the ‘refund deposit’ button can no longer be found on the app, and hoping to find answers on how they can get their refunds. 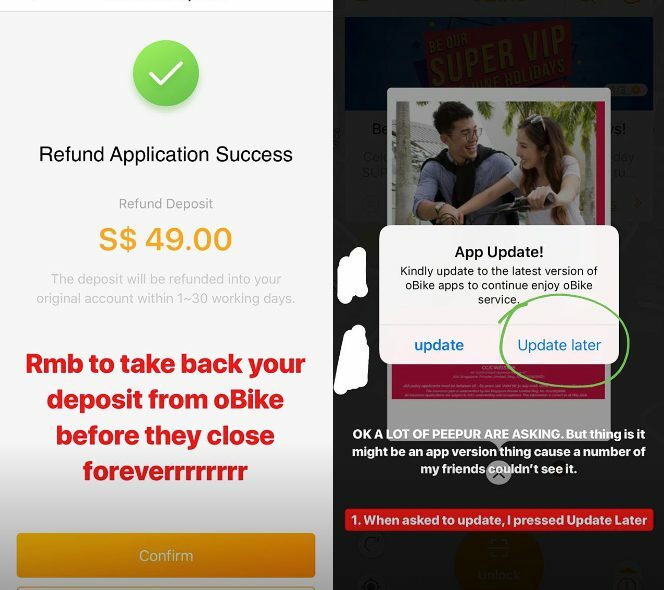 One oBike user shared on her Instagram account that she successfully got back her $49 deposit through the oBike app. She said that she was able to do so as she had not updated the app to the latest version, and the option to refund was still available. 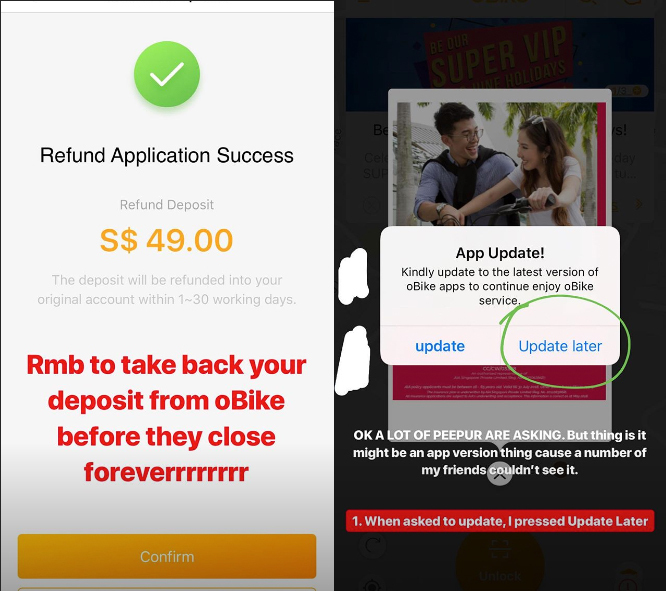 She said she was able to find the ‘refund deposit’ button in the ‘my wallet’ section, and shared that she was on the older version 2.5.2 of the oBike app. According to her advice, users who have not updated to the current version 3.4.3 may try their luck to see if the app still allows them to take out their initial deposit. Other users who found themselves stuck without a possibility of getting their deposits back have signed a petition against oBike. The petition was started by Harwinder Singh, who had noticed prolonged delays in deposit refunds from oBike since January 2018. 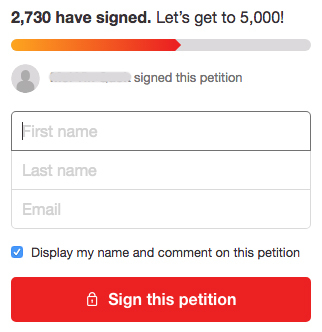 As of 2pm on 26 June, 2,730 people have signed the petition. Singh has, however, posted an update saying that LTA has responded by advising users to seek help from the Consumer Association of Singapore (CASE). Similar to its response to the above mentioned petition, LTA has told the media that it urges users facing issues with oBike refunds to bring the matter up to the CASE. Many are concerned that without any legislative powers, the best that CASE, a non-government organisation, can do is attempt to mediate the problem between oBike and its users without any guarantees. In addition to the refunds oBike owes its users, the firm has also “recorded some S$4.25 million in losses” at the end of 2017, and currently has $22.7 million in liabilities. It was reported that an undisclosed logistics partner suspended its services to oBike due to unpaid fees, and PR agency, Ruder Finn, also put their contract with oBike on hold after “several months of fees” were not paid. With all the debt oBike is in, and hardly any support from authorities, users’ hopes of getting a refund currently seem dismal. If you successfully manage to reclaim your deposit, please share how other users can do the same!